As a nurse who works until 12:30 am, I usually need a late night energy booster. My go to is a large Dunkin’ coffee with cream, which gives me a much needed energy boost, but not so much needed extra calories. This is my dilemma. If I could have a way to boost my energy quickly, without adding extra calories late a night, I would be ecstatic! AeroLife is the solution to my dilemma and why I decided to take the AeroLife Newtrition Challenge! AeroLife is an air-based nutrition system that delivers powdered blends of vitamins and supplements. The reloadable system is small enough to carry in your pocket and designed to work anywhere, fast! 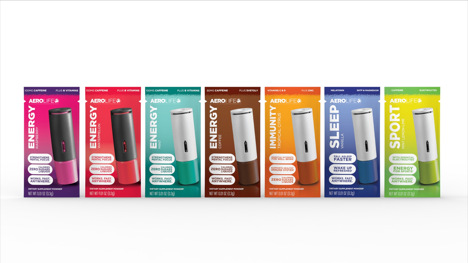 AeroLife works by inserting the aeropod into the reusable mouthpiece, twisting and pulling it open and then gently drawing powder into your mouth and swallowing. Simple, fast and easy. I will admit that as an asthmatic I was a little nervous about using this product at first, but after reading how it works and knowing that the particles are too big to get sucked into my lungs, I gave it a try. It works! It is quick to use and quick to take effect! I start feeling more energized almost instantaneously, without any ill effects like palpitations or shakiness that sometimes occurs with energy drinks. Convenient! Pocket sized and portable! It is about the same size as a tube of lipstick. Zero Calories, Zero Sugar. I hate adding extra calories into my diet just for an energy boost! A variety of options! AeroLife Energy, Immunity, Travel, Sleep, Sport and Coffee. Different flavors are available too! I tried the AeroLife Energy and loved it! One air-based shot provided me with a ton of energy. The unique powdered blend delivers 100mg of caffeine, equivalent to one large cup of coffee, plus B vitamins! Basically you draw the powder into your mouth, the particles land on your tongue and then you swallow! The only downside for me is that there is an extreme burst of flavor when the particles land on your tongue. I am pretty sensitive to flavors and tend to not like anything too overwhelming, I found the mint overwhelming, but the raspberry and watermelon were good. The plus is that the taste only lingered for a minute or two and with the choice of multiple flavors I can surely avoid the mint! Curious??? Want to try AeroLife for yourself??? For a limited time AeroLife is offering a free trial of AeroLife Energy. You get a free 12 pack and can choose the flavor, either watermelon or raspberry. You can learn more about AeroLife on their website. You can also follow them on Facebook, Twitter and Instagram! What do you think about AeroLife? I hadn’t heard of this type of thing before, I would be interested to know some of the ingredients of it. I will have to check it out. Hmm. I’m not a big fan of “energy” type products, I’m so easily affected by caffeine that I’m always scared they’ll make me super jittery. I don’t like the jitteriness either and surprisingly this did not make me jittery! Might be interesting to try this pre-workout Toni!!! Suzanne @WorkoutNirvana recently posted..Will You Gain Weight From Lifting Weights? I am going to try it pre workout for sure! Wow. We are definitely getting into the beyond. Sounds like an advancement into A Brave New World or some sort of other futuristic-type-thing. Getting nutrients from air, doesn’t sound like a bad idea, just kind of funny. Hopefully we don’t get ahead of ourselves and skip the fruits and veggies!